Similar daggers to this with finely carved handles can be found elsewhere, but the scenes depicted here are unique. On one side there is a battle scene on land and water; the other side depicts animals such as lions, ibexes and dogs. 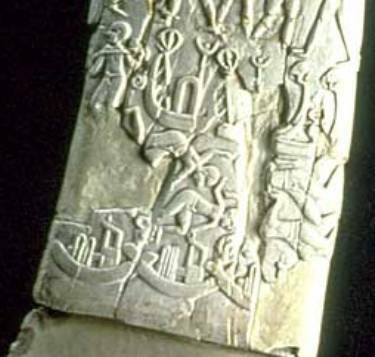 At the top, above the knob, a man in the robes of a Sumerian priest-king is restraining two rampant lions. The piece raises questions about artistic contacts with Mesopotamia. It could depict a battle between communities whose differences can be seen in the design of their boats. What is certain is that it is an early example of Egyptian bas-relief and it is carved with great mastery. The silex is worked with a polished blade cut on one side by thin parallel incisions; this is carving at its most refined, and characteristic of this period of Egyptian civilization. 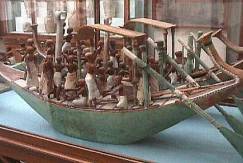 The Egyptians had little use for roads the Nile river was their highway. 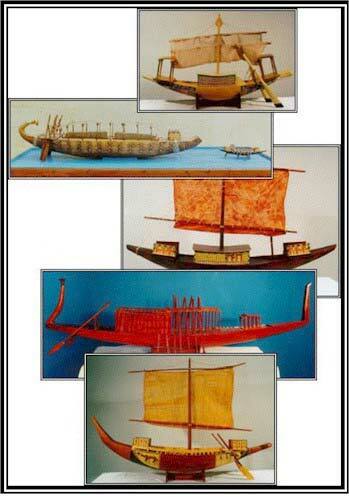 Models from the second millennium BCE of fishing boats that show a sickle shaped hull. The paddlers appear to be sitting upon and not in the craft that would be the case if the boats were of reed raft construction. The ancient Egyptians faithfully recorded the daily life of their culture in their art leaving a historic legacy that leaves little to guess work. 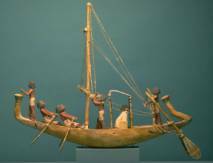 Similar mbost models were found by Howard carter in the Tutankamen tomb. 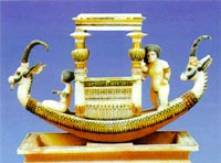 Funerary Barge, Polychrome wood boat models and Solar Boat Pectorals from the Tutankhamun Tomb, symbolically and in allegory the Egyptians embraced the cycle of the sun a natural reflection of the cycle of life. The sun is as man’s spirit; the sun is the spirit of the day as a man’s spirit is the light of his life. 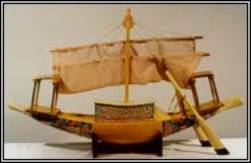 These models of the ancient boats and ships of Egypt were created by Egyptian artisans at the historic time the boats were being used. 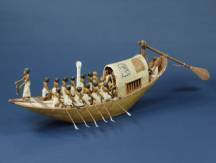 The Egyptian culture documented activities at all levels within their culture and these represent excellent illustrations of the actual boats and ships used in daily life of the Egyptians.